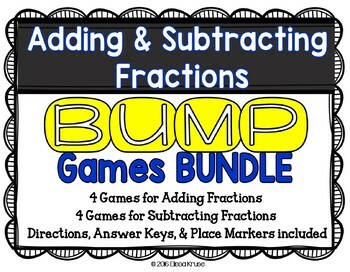 This Adding and Subtracting Fractions BUMP Games BUNDLE includes eight different games with varied skills related to adding and subtracting fractions. They range in skills required from computing without reducing to having to reduce. Some games use pictures, and some use numeric fractions. There are 4 games per set. The flexibility of this bundle is great. You decide what games and skills your students are ready for. They all look very similar, and the rules are the same for each game. You can have students work independently, in pairs, in groups, or in any way that works for you. Students don’t all have to work on the same game at the same time. I love these for math centers. As students are ready to advance to new skills, they will know how to play. All answers are proper fractions, smaller than 1. This game would be great for students who are just starting to learn about the meaning of fractions, how to represent them as pictures, and how to add them without reducing. The answers are also in picture form. This game would be great for students who are just starting to learn how to find the LCM or LCD to add fractions with uncommon denominators. This game would be great for students who are just starting to learn about adding basic fractions using the number form of fractions. 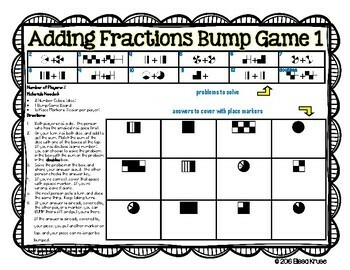 This game would be great for students who are just starting to learn about adding basic fractions and reducing fractions, using the number form of fractions. Game 4– Players find the addends that make up sum of fractions This game requires to break down a fractions into its parts and to understand that a fraction is a smaller set of fractions that add up to make its sum. This game would be great for students who are just starting to learn about the meaning of fractions, how to represent them as pictures, and how to subtract them without reducing. The answers are also in picture form. 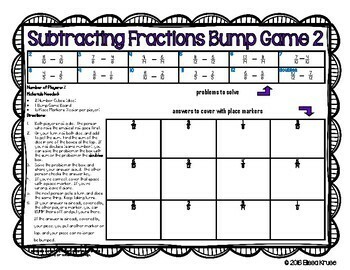 This game would be great for students who are just starting to learn about subtracting basic fractions using the number form of fractions. This game would be great for students who are just starting to learn about subtracting basic fractions and reducing them, using the number form of fractions. This game requires students to look at a fraction, which is the answer (difference) and find the subtraction problem that would yield that answer. Some require reducing. How can you use these games?